Frantisek Zdenek Maurice Augustin Eberl was born in Prague on May 25, 1887 as son of Roman Catholic parents. The family has both Swedish and French roots and is part of the city´s upper bourgoisie. Frantisek Eberl senior is not only president of the Prague-based Länderbank but also a houseowner, administrative head of the residental district Smichov and beyond that a shareholder in his father-in-law´s transport company. Due to that he is able to provide both childresn - Frantisek has a half sister from his father´s first marriage - with a sheltered childhood. Eberl’s extraordinary artistic talent reveals itself quite early. Already in 1903 he is admitted to the Academy of Fine Arts in Prague. He and Emil Filla are students of Vlaho Buhovac. Soon it turns out, however, that Eberl´s artistic and social ambitions are incompatible with the Academy´s conservative tratiditon. After leaving Prague Eberl stays several months with his Swedish relatives. Eventually, in October 1904 Eberl who has an excellent command of German enrols in the Academy of Fine Arts in Munich. From the very beginning he is getting excellent evaluation ba his professors (Karl von Marr, Angelo Jank and Franz von Stuck). Not only are the young artist´s diligence and talent highly commended in his certificates but it is also recorded that he won a prize with one of his works. During the time of his studies Eberl is undertaking journeys to Sweden, Denmark and the Netherlands. In 1909 his first solo exhibition takes place in the Rudolfinum in Prague. At that time the artist has already graduated and is himself lecturing at the Academy of Munich. After the creation of some satirical caricatures targeting the Bavarian dynasty Eberl is forced to leave Munich. 1911 he takes up residence near Montmartre, Paris. In Paris the young artist is quickly established and soon he shows his exhibits in the most famous Parisian salons. In the course of World War I he joins the Comité d´action tchèque à l´étranger. This assocation is aiming at the foundation of a Czech-Slovak state - independent of the Austro-Hungarian Empire. And again Eberl gives proof of his talent in caricature by drafting posters and pamphlets serving the political issue. 1914 Eberl joins the Czech Legion, which as part of the Foreign Legion is fighting alongside the Allied Forces. After one and a half years of serving the artist due to a severe injury is forced to leave the front lines. For the rest of the war he works with the Red Cross. Even during the war exhibitions are taking place thus enabling Eberl to present his works to a steadily growing audience. In the 20ies Eberl´s career is quickly accelerating setting many a direction for his later life. Numerous big solo exhibitions are taking place; the legendary art trader Berthe Weill promoted him in several art shows in her gallery. He is getting a member of the Salon des Artistes Indépendants and is admitted to the Freemason lodge Thélème which premises he is going to redecorate in 1956. In addition to all his activities he organises domestic and foreign exhibitions and ties to support his artistic colleagues. Even in his private life the glamour of the Golden Twenties is showing. Eberl is keeping exotic pets like a lion and a crocodile, and is driving races for Bugatti. 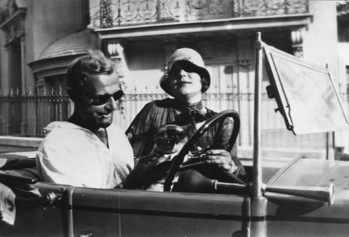 Together with his Danish wife Frida "Elie" he is part of the chic, eccentric Parisian Bohème. Eberl reaches the zenith of his career when he is made a Knight of the Legion of Honour in 1928. 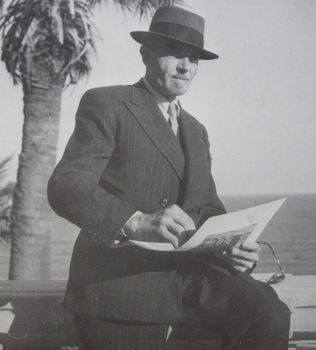 From 1930 the artist starts to spend the summer months in Monaco, soon the principality becomes his second residence. He also grows into a regular visitor of the famous casinos. In 1939 Eberl as a confessing humanist publishes an early protest painting against the Nazi Regime in the Parisian Salon d´Automne titled Kulturkampf. Shortly after the artist is struck by a heafy blow of fate: in the middle of the war Elie dies of a heart failure. Soon after Eberl moves to Monaco for good and joins the Résistance as an active member. At great personal risk he creates handsigned political caricatures, they are thrown on occupied areas to mobilize the population´s resistance. He also helps to smuggle Jews threatened be deportation to Spain. 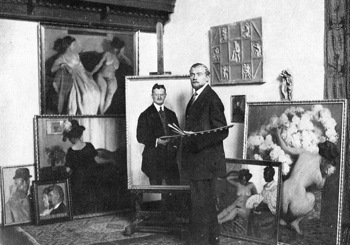 After the end of war François Eberl returns to his Parisian studio in the Rue Camille Tahan. In the end of the 1949ties he marries Béatrice Seidl, a widowed acquaintance of his Parisian time. With this unioin a quiet, bourgois way of living begins for Eberl serving also as a stepfather for Béatrice´s stepson Marc Frédéric. The couple uses to spend the summer months in Monaco, where the artist has meanwhile been nominated as honorary citizen. The artist takes actively part in Monaco`s cultural life and organizes many remarkable exhibitions in the principality. Meanwhile the co-founder of the same named salon receives the Prix Populiste for his typical milieu studies. 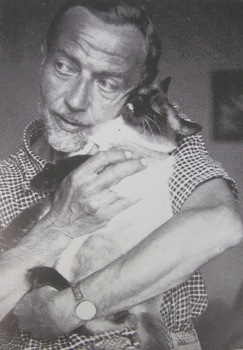 On 8 October 1962 Eberl dies of cancer in his studio in Paris. Following his wish he is buried in Villier-le-Bel in the vicinity of Paris.